Using Pre stretch hand film will increase wrapping efficiency, increase load protection, and reduce materials cost. Because this stretch wrap is pre-stretched, it will have less neckdown and will decrease the amount of times the stretch film must be wrapped around the pallet. 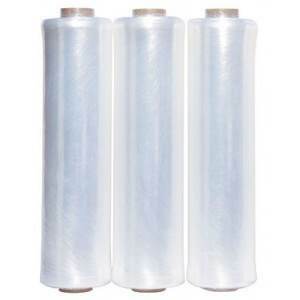 Because less stretchfilm is necessary, you will ultimately reduce your materials costs. Prestretching also increases the load tension and will continue to tighten around the load even after it has been wrapped. Our prestretch film has a great variety of applications as an industrial packaging product. Both cast film and blown film can be pre-stretched.